Hi, Thank you, friends and viewers. 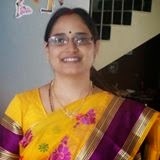 Today I will post how to make thattai recipe. Thattai or vadappalu or pappu chekkalu is crispy snack item made with rice flour. A little difference is there between all of them in making. We have to add three flours for making thattai, for vadappalu and pappu chekkalu we use only rice flour. Some use dry rice flour and some use wet rice flour. Normally my mom use wet rice flour as we use for ariselu. Some people cook rice flour as we do it for chegodilu. Thattai is a Tamil recipe, I took it from my cousin who stays in Chennai. Once when she visited me, brought them for me to taste and gave the recipe. I found very interesting and tried. We normally prepare them by adding all other ingredients to rice flour. But for this thattai we have to add two more flours, black gram flour, and roasted Bengal gram flour. 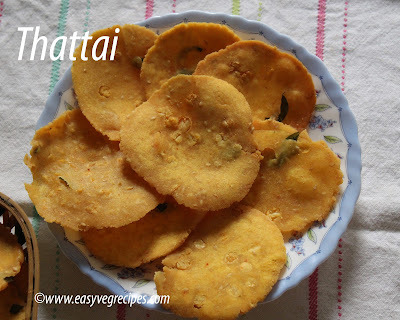 Thattai -- Crispy Indian snack item made with rice flour and dal flours. Soak bengal gram for one hour. Roast black gram till the aroma comes, cool it and grind it to make a fine powder. Or we can get it done in the flour mill (if you stay in India), as I have done so. Grind the roasted bengal gram to make fine powder in the mixer grinder. Keep all the flours ready. In a wide plate or bowl add all other ingredients except butter and oil. Mix them well and lastly add butter(should be in room temparature). Add water little by little and make smooth dough. Cover it with a damp cloth. Heat oil in a kadai. Let the fumes come, then reduce the flame to medium. Make small lemon size ball of the dough. Grease both sides of the puri presser, place an oil sheet. Grease the sheet also, place one lemon size ball over the sheet. Cover it with the other flap of oil sheet and again cover it with opposite plate. Gently press it with the handle. Do not over press, this will make the thattai very thin. Or we can make them using a flat bottomed bowl also, by placing the thattai ball on an oil sheet and covering it with another sheet and pressing with the bowl. I used puri presser to make them. Slowly and gently remove the thattai from oil sheet and drop in hot oil. Fry them till they turn golden colour. Remove from oil and place them on a kitchen paper. Fry them in medium flame only, otherwise they won't cook inside and turns soggy. Repeat the same with the rest of the dough. Do not let the dough dry out, so keep the damp cloth over it. Serve thattai with a hot cup of tea or enjoy it any time of the day.